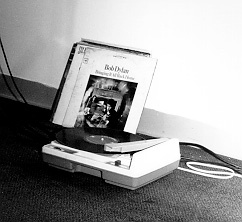 All Hail the Mighty Fisher Price® Record Player! Bow down before the mighty Fisher Price® Record Player, all ye who enter here! Welcome, brothers and sisters, to the First United Church of the Fisher Price® Record Player. The Reverend Most High Cybermuffin has been very busy lately, having relocated to Pagan Lands (a.k.a Texas), where the natives are unenlightened to the sanctity and salvation that is the Fisher Price® Record Player. I can only update this page when I have time off from converting the heathens (being a missionary is a tough position) so I apologize if the sermons don't change much. Breaking News: I've had word from Kevin who ran The Record Rack, where I used to refer people seeking replacement needles, and he is shutting down the web site. :-( He did let me know that the make and model of the needle that fits the Fisher Price Record Player is one called Pfanstiehl 911-DS77, and he also suggested another web site, Garage 'A Records, that may be able to supply replacement needles. Good Luck. This is a picture of the Orginal Player (that which began the obsession which begat the First United Church FPRP). It belongs to Nick Franclik, the bass player for the Electric Farm. He used to bring it to mellow shows, like at the Open Space Art Gallery in Allentown. (Indeed, that is where this picture was taken by my good friend Fluffy.) and lays things like Bob Dylan and early Rolling Stones on it It's missing the plastic lid, but that's okay. This player was featured heavily in the artwork for the Farm's first release, Six, in 1995. Nick actually has a bunch of Players, not just this one. I think this one is his favorite, though. So I found one for Erik's sister ($6.00 off of Ebay) and one for Fluffy ($3.00 in the Quakertown Salvation Army - the kid who rang it up wasn't even sure what it was supposed to do. I was like, "It's a toy turntable. For playing vinyl. Aaaahh, kids these days! Never mind!") and one for myself. Then I had to move to Germany, so I gave up on looking, being as how the Germans couldn't possibly understand the charm of the Fisher Price Record Player. 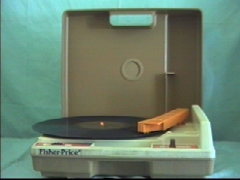 Then I moved to England, where there were no Fisher Price Record Players either. Then a brief stint back in Allentown, and now I while away the days in the DFW area. Thanks for listening to my preaching. If you wish to make a pilgrimage, I have included directions to the Holy Land for you.